Course Goal / Learning Outcome describes broad aspects of behavior which incorporate a wide range of knowledge and skill Upon completion of this course the student will have reliably demonstrated the ability to use the conventions of grammar when creating paragraphs. Learning Objectives tend to describe specific, discrete units of knowledge and skill can be accomplished within a short timeframe Given a paragraph of ten sentences, the student will be able to identify ten rules of grammar that are used in its construction. What behaviors or applications would enable you to infer students’ understanding of what they have learned? What evidence or products, if done well, would provide valid ways of distinguishing between understanding and mere recall? It is easy to measure each of the objectives. Either the student has or has not accomplished each one. These measurable objectives can then be used as the basis for your grading or another type of student assessment. For example, based on the first learning objective above, if a student is able to list all 5 plant hormones they earn 100% for the assignment if they can only list 4 plant hormones they earn 90%, and so on. Developing a basic understanding of Bloom’s Taxonomy (Bloom et al., 1956) is a good place to start as you begin writing learning objectives. Bloom’s Taxonomy in a nutshell: In the late 1940’s a group of educators began classifying educational goals and objectives. The intent was to develop a classification system for three domains: the cognitive (mental skills or knowledge), the affective (feelings and emotional skills or attitude), and the psychomotor (manual or physical skills). The work that resulted in the cognitive domain was completed in 1956 and is commonly referred to as Bloom’s Taxonomy of the Cognitive Domain (Bloom et al., 1956). The major concept of the taxonomy is that educational objectives can be arranged in a hierarchy that moves from less to more complex levels of knowledge. The levels are successive; one level must be mastered before the next level can be reached. The original levels published by Bloom et al. (1956) were ordered as follows: Knowledge, Comprehension, Application, Analysis, Synthesis, and Evaluation. In 2001 Anderson and Krathwohl published a revised version of Bloom’s Taxonomy that reflected what has been learned in the forty or so years since it was first published. In summary, the changes reflect more outcome-focused modern education objectives and include switching the names of the levels from nouns to active verbs. The two highest levels have also been changed with the pinnacle level now being ‘create’. The revised levels are: Remember, Understand, Apply, Analyze, Evaluate and Create. View CELT’s Revised Bloom’s Taxonomy webpage. Effective learning objectives need to be observable and/or measurable, and using action verbs is a way to achieve this. Verbs such as “identify”, “argue,” or “construct” are more measurable than vague or passive verbs such as “understand” or “be aware of”. As you design your course focus on creating clear learning objectives and then use these objectives to guide class assignments, exams, and overall course assessment questions. Below are examples of action verbs associated with each level of the Revised Bloom’s Taxonomy. These are useful in writing learning objectives, assignment objectives, and exam questions. Anderson, L.W., & Krathwohl (Eds.). (2001). A Taxonomy for Learning, Teaching, and Assessing: A Revision of Bloom’s Taxonomy of Educational Objectives. New York: Longman. An interactive model of learning objectives shows the relationship between the knowledge dimension and the cognitive process dimension. 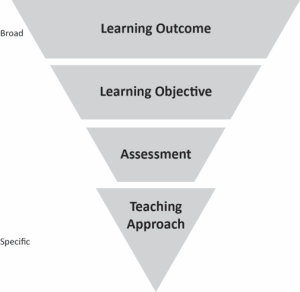 Content on sample learning objectives adapted from: Center for Teaching, Learning and Technology, Washington State University (2013).